Apple’s iCloud service, paired with iOS 5 and Lion, offers users a whole wealth of new sync features, access to purchased content, and geolocation fun. Unfortunately, as iCloud is the company’s fourth online service iteration—fifth, if you count registering for base-level Apple IDs—trying to upgrade can be confusing at best, slam-your-head-against-a-wall-in-frustration at worst. To help ease the pain (and keep your walls dent-free), we’ve put together some common upgrading scenarios for migrating to iCloud. Before we dive in, here are some basic terms you should be familiar with. 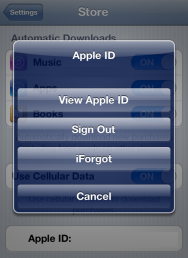 Apple ID: An Apple account, used to purchase items on iTunes or on the Apple.com store. Usually your primary email address, a mac.com address (if you were a .Mac subscriber), or a me.com address (if you were a MobileMe subscriber). If you signed up for an Apple ID before iTools, you may have one that’s simply a username (i.e “scaldwell” as opposed to “scaldwell@macworld.com”). MobileMe account: An account with Apple’s old sync service. A MobileMe account is a type of Apple ID. iCloud account: An account with Apple’s new sync service. An iCloud account is a type of Apple ID. Convert, merge, or ugprade to iCloud: If you have an Apple ID that is not an iCloud account, you can convert it into one. If you have an Apple ID used only for purchases, you can convert it to iCloud by logging into icloud.com. If you have an active MobileMe account, you need to convert it by going to me.com/move. By default, iCloud supports devices running iOS 5 and computers running OS X Lion. But what if you’re still running Snow Leopard, or iOS 4? What do you lose when you merge your MobileMe account? What if I upgrade to iCloud and I’m still running Snow Leopard (or Leopard)? As Apple has yet to release a patch for its earlier operating systems that enables iCloud in System Preferences, you won’t be able to automatically sync your iCloud mail, contacts, and calendars; though you can set up sync for your mail and calendars by manually adding your iCloud account to Mail. You’ll also be able to access iCloud features via the iCloud website. When it comes to features like Documents in the Cloud, Photo Stream, and Find My Mac, however, you’ll be left in the cold. What if I upgrade to iCloud and I’m still running iOS 4? If you have a device that’s still running iOS 4, you’ll be able to activate Find My device by adding a MobileMe account under the Mail, Contacts, and Calendars pane in the Settings app, but you’ll need to set up your iCloud mail, contacts, and calendars manually (which requires a bit of legwork). As with iCloud on Snow Leopard, it’s not the easiest setup, but doable. If you’re currently syncing with MobileMe and wish to avoid the hassle, however, you may want to wait until you upgrade your system (or Apple releases a patch that adds iCloud support). What am I going to lose if I move my MobileMe account to iCloud? Apple has a fairly detailed FAQ on what will change when you convert your account, but in case you don’t feel like reading through it, here’s a summary: You’ll keep syncing your mail, contacts, calendars, bookmarks, and notes; you’ll still be able to use Back to My Mac and Find My iPhone; and though they’re not supported under iCloud, you’ll continue to publish your iWeb websites and photo albums in Gallery, and have access to your iDisk, until June 30, 2012. After moving your account, however, you won’t be able to sync Mac Dashboard widgets, keychains, Dock items, System Preferences, and data from third-party Mac apps that integrate with MobileMe. I have a MobileMe family account. How can my family members and I move our accounts to iCloud? Since iCloud is a free service, the concept of “family packs” has gone away. As such, you can move each MobileMe sub-account over to its own iCloud account by heading to me.com/move. I have a MobileMe account and a separate Apple ID. Can I merge them into an iCloud account? If you’re looking to move yourself—and yourself only—over to iCloud, here are various scenarios you may run into when signing up. You have never purchased anything from Apple (besides this brand-new device you now have in your hands). You don’t know what an Apple ID is. You want to sign up for a free iCloud account: Great! You can do this one of three ways: sign up from the icloud.com website; sign up from a mobile device running iOS 5; or sign up, using the iCloud pane of System Preferences, from your computer running OS X Lion. You have a MobileMe account you use for syncing and for purchasing items: If this MobileMe account is your only account, and you’re running both iOS 5 and Lion, you can head on over to me.com/move to convert your account to iCloud. If you have a separate account for purchases, you can add it to the Store pane in the Settings app. You have a MobileMe account for syncing, and a separate Apple ID for purchases: Move your MobileMe account to iCloud. After you’ve done so, you can add your Store credentials separately. On an iOS device, open up the Settings app and tap the Store menu. If you’ve added your iCloud account to your device, you should see those credentials logged in; log out and input the Apple ID you use for purchases. On a Mac, open iTunes and go to Store -> Sign Out, then Store -> Sign In and log in with your non-iCloud Apple ID. You had an iTools/.Mac/MobileMe account, but stopped subscribing; now you want to use that email address for iCloud, but you use a different Apple ID for purchases: Convert that address to iCloud by using the method detailed in the scenario above. 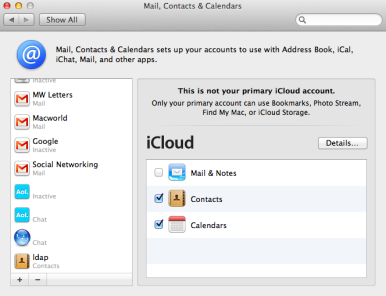 Add a secondary iCloud account to your Mac from the Mail, Contacts & Calendars pane in System Preferences. You have a MobileMe family account because you needed multiple email addresses. You want to use one account for iCloud, but you still want to receive email on your other MobileMe account: Convert both accounts to iCloud, unless you have some reason to stay on MobileMe (see the section above on “What am I going to lose if I move my MobileMe account to iCloud?”). Set up iCloud on your devices with the account you previously used for MobileMe syncing. 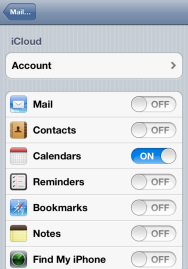 To add your secondary email account on an iOS device, go to Settings -> Mail, Contacts, Calendars -> Add Account -> iCloud. To add it on your Mac, go to System Preferences -> Mail, Contacts, & Calendars -> Add Account -> iCloud. After you’ve done so, your significant other can change their Store credentials to your iCloud account. On an iOS device, open up the Settings app and tap the Store menu. Log out and input the account you use for purchases. On a Mac, open iTunes and go to Store -> Sign Out, then Store -> Sign In and have them log in with your iCloud account credentials. You can sync mail, contacts, calendars, reminders, and notes with a secondary (or tertiary) iCloud account via the Mail, Contacts, and Calendars pane. You can each have individual accounts but share contacts, calendars, mail, reminders, and notes. On an iOS device, go to Settings -> Mail, Contacts, Calendars -> Add Account -> iCloud. This will enable you to sync with your significant other’s mail, calendars, contacts, notes, or reminders—in addition to your own—by toggling the appropriate switches. (They can also share your information by doing the same.) Secondary iCloud accounts on a device don’t get access to everything, however: Your significant other’s account can’t be used for Safari bookmarks, Photo Stream, Documents and Data, Find My iPhone, or Backup. On a Mac, you can add a secondary account by going to System Preferences -> Mail, Contacts, & Calendars -> Add Account -> iCloud. You have a MobileMe account you use for syncing and purchases. Your family also uses this account for purchases. Everyone wants to switch to iCloud for syncing, but still use your account for purchases: Convert your MobileMe account to iCloud by visiting me.com/move. Your other members of the family can sign up for iCloud by going to the website or by setting it up on their iOS 5- or Lion-enabled devices. After everyone has set up their iCloud accounts, they can change their Store credentials to your iCloud-née-MobileMe account. On an iOS device, open up the Settings app and tap the Store menu. Log out and input the MobileMe account. On a Mac, open iTunes and go to Store -> Sign Out, then Store -> Sign In and have them log in with your iCloud account credentials. You have an Apple ID you and your family use for purchases. Everyone wants to switch to iCloud for syncing, but still use your account for purchases: Leave the Apple ID as-is. Make an iCloud account for each member of your family by visiting the website or by setting it up on their iOS 5- or Lion-enabled devices. After everyone has set up their iCloud accounts, they can change their Store credentials to your original Apple ID. On an iOS device, open up the Settings app and tap the Store menu. Log out and input the Apple ID. On a Mac, open iTunes and go to Store -> Sign Out, then Store -> Sign In and have them log in with your iCloud account credentials. Can't find your specific scenario above? Here are a few general tips. If you have an Apple ID that you want to use for sync and purchases: Convert it to iCloud. If you want to sync with one ID and purchase with another: Convert one to iCloud; use the other to log into your Store credentials. If you want to sync with multiple IDs: Hook up your primary account to your device; add a secondary account for calendar and contacts syncing using the Mail, Contacts & Calendars pane in System Preferences on your Mac or in the Settings app on your iOS device.